Heart, drive, and a desire to help others are hallmarks of the personal training instructor graduates of the National Personal Training Institute in Sacramento, California. 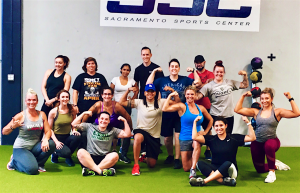 Although not everyone has what it takes to become a professional personal trainer, for those with the right stuff, NPTI in Sacramento will supply the guidance, tools and technique to take you to the next level as a successful and well-rounded professional personal trainer. You will have access to some of the most skilled and dedicated personal training instructors to be found anywhere in a fantastic facility with the latest equipment. As a fully integrated program of practical physical training techniques, health and nutrition, human physiology and business skills, you’ll go from the classroom to the gym each day in order to put everything together. At the National Personal Training Institute in Sacramento, we provide you with the skills that you will need to help others achieve the gift of wellness. Choose between flexible schedules that enable you to earn a nationally respected diploma as a personal fitness instructor and be poised to take your NASM Certification exam—all in a 500-hour program over six months, or a year if that better fits your schedule. We assist you every step of the way, from flexible payment schedules to job placement assistance. Our graduates are in constant demand so it’s not uncommon for students to see opportunities materialize even before graduation. Whether you choose to work in the Sacramento area, elsewhere in California, or anywhere in the country, you will have the support of NPTI and our reputation for well educated, professional, prepared and experienced personal fitness training graduates. The National Personal Training Institute of Sacramento’s partnership with NASM will give you an incredible hands-on education that will fully prepare you to enter the competitive job force. Graduates of NPTI will receive a Diploma as a Personal Trainer and will be eligible to sit for the NCCA accredited NASM Certification upon completion. Get in great shape while you get the educational foundation to start your new career as a professional personal trainer at the National Personal Training Institute in Sacramento, California. Don’t wait another minute to get in the best shape of your life and obtain the skills to be a successful personal training instructor through NPTI in Sacramento, CA.